Our beloved Issy went into Yale Hospital to see an ENT and pulmonologist, and after a weekend's worth of tests and Issy's deteriorating condition they discovered a cerebellar tumor by her brain stem. It took an 8-hour surgery by a brilliant, dedicated team, and a whole lot of prayers, and now Issy is "Tumor-Free." Leaving Frank, Jeena, Issy, Lu, and all those praying for Issy in a posture of profound gratitude to God. But the medical expenses are high, and there will be months of hospital bills (between $250,000 and $500,000, estimated.) 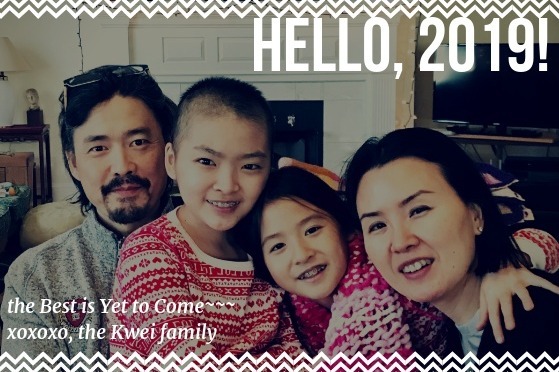 We'd love to help defray the cost for our Kwei-Choi family. Today is Tumor Independence Day 247 / finishing up Boston week 12. Yes, Issy and I are still in Boston receiving physical, occupational and swallow therapies. Issy completed proton radiation treatment on Jan. 14th. Othr than losing some patches of hair on the back, she did great and won the hearts of all the staff (Thank You, Mass General radiation oncology team!!!). We decided to remain in Boston for a swallow program appointment at Boston Children's Hospital on Jan. 22nd. Well, that appointment involved a swallow test and the images captured showed Issy still could not swallow at all. We showed those to the swallow specialist Issy was just starting to work with back at Mass General and this super astute therapist suspected something else was in play... because Issy had been working so so hard on her swallow exercises and the therapist (and us too) can clearly see her triggering swallows. So this led to an ENT appointment where the endoscopy sort of confirmed the specialist's suspicion that Issy's upper esophageal sphincter (UES) muscle had tightened (possibly due to radiation). The ENT actually told us her swallowing ability "worsened" compared to her previous swallow test done in Oct prior to radiation. Devastating news... for a child who hadn't swallowed in 8 months. However, he gave us hope and sent us to a super specialist at Mass Gen. The neuro-gastroenterologist (there are maybe 5 of these specialists in the country?!) performed a procedure - I won't get into it here but it was horrific- to measure the pressure of the muscle which confirmed the UES is indeed closed, which meant absolutely nothing can pass through her throat. We took this news as a positive. Why? Before this new development, we were told by many, "time will heal, continue swallow exercises" with no timeline, no clear rate of recovery whatsoever. But with this confirmation, it gave the ENT and Neuro-gastro something to work with, something they were trained to fix! Issy is now scheduled for a surgery on March 20th (1st day of Spring!) where the ENT will perform a myotomy of the UES. It is a permanent incision of the muscle which he says has 80% success rate and will provide immediate relief so that Issy can re-train to swallow and eat again. Hallelujah! 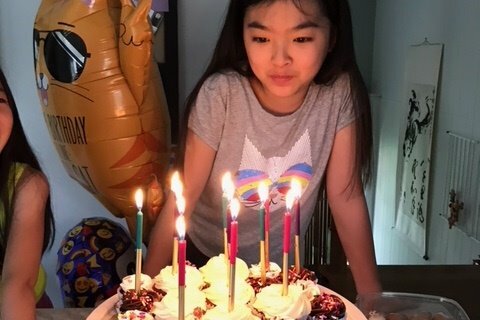 Issy set a goal of eating ice cream on her birthday (she turns 13 on May 4th) and we are so hopeful that it will happen. In the meanwhile, she continues to improve physically, her last MRI in Feb. was CLEAN and happy to report hair is sprouting abundantly, giving Issy a naturally chic 'do. 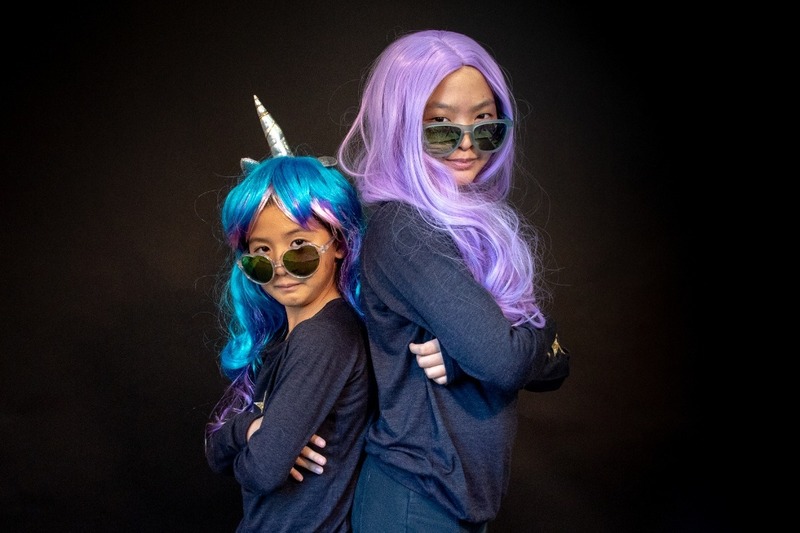 She also picked up knitting, reading tons, enjoying studying together with Harvard Buddies (Harvard students who come and help with homework) and keeping up with school work thanks to a tutor that her school found for us. She daily amazes us with her grace and spirit of calm no matter what, teaching us patience and persistence wins the day. And as this is a new year, so is the cycle of deductibles. :) Your incredibly generous contribution is going towards not only the medical bills and Boston apartment housing costs but also allows Issy to participate in additional rehab treatments that are not covered by health insurance such as: aquatic therapy once we return home (amazing for improving limited mobility), therapeutic horseback riding in warmer weather (Issy's #1 activity to look forward to), swallow/feeding programs, and shhh... maybe even a little pup that she's been wanting (she's been visiting a doggie daycare facility for small doses of fur love and snuggles). So this update is closing on a very optimistic note. Will keep you posted after the surgery on 3/20. We hope you are enjoying the beauty of the Season and its buzzy spirit. As of today, Dec. 21, 2018, Issy is 171 days tumor-free! Here is a very belated (wow- 3 months since our last update?!) update on Issy’s journey to healing. Issy received her 4th and final chemo infusion in mid-Oct., however, took many weeks to recover from it. She received total 14 transfusions during chemo treatment: 3 blood and 11 platelets… most of them, during 3rd and 4th rounds of infusions. There were countless rush to Yale oncology clinic each week, but Issy modeled for us perseverance and grace each day, even on days when the mountain seemed impossibly high. She was and continues to be the most patient, patient. 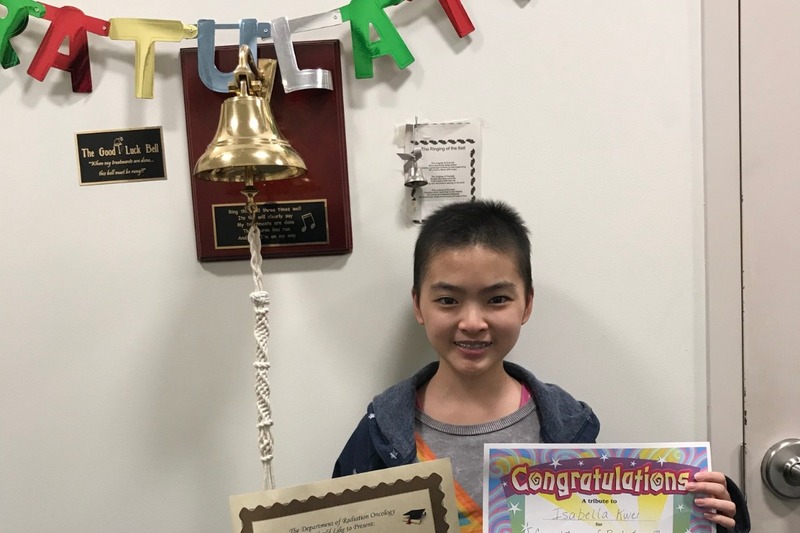 She finally checked off 'chemo' from her treatment plan on Nov. 15, 2018, and was cleared for the next step: radiation treatment. After consulting with Yale radiation-oncologist, we took Issy to Dana Farber and Mass Gen for second opinions. You see, the rare tumor location (Germinoma cells just don’t appear on the brainstem) meant no standard treatment plan in place for Issy, so no one could say, “THIS is the best treatment and here’s the research behind it.” We were seeking second opinions on whether Issy truly needed radiation AFTER going through the horrific chemo treatment… for a tumor that was completely removed. Also, we desperately wanted Issy to get a break from all the hospitals. 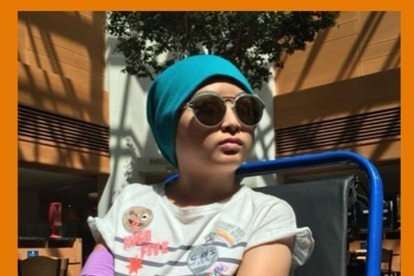 Alas, the specialists at both hospitals agreed that given what they know about Germinoma (funky and unpredictable, were their words), Issy most definitely needs radiation treatment to ensure eradication of any cells left behind. Yes, even after 4 rounds of chemo. 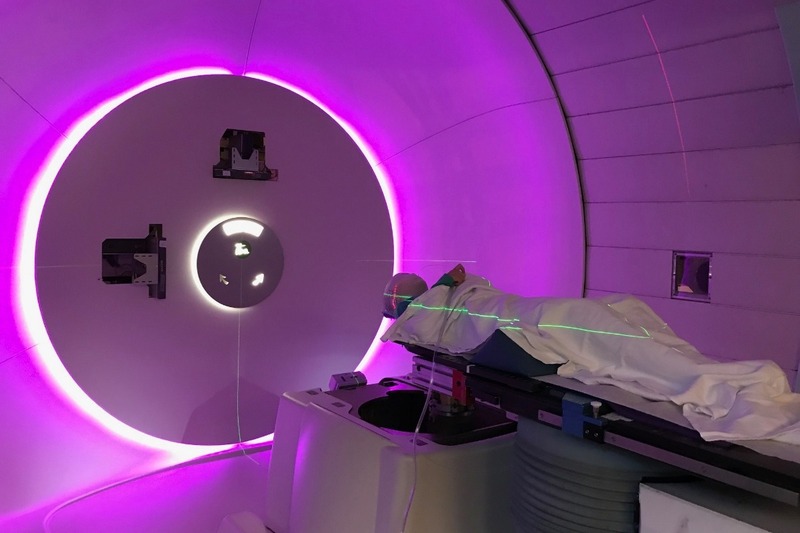 After some research, we decided to go for Proton radiation treatment at Mass General Hospital. 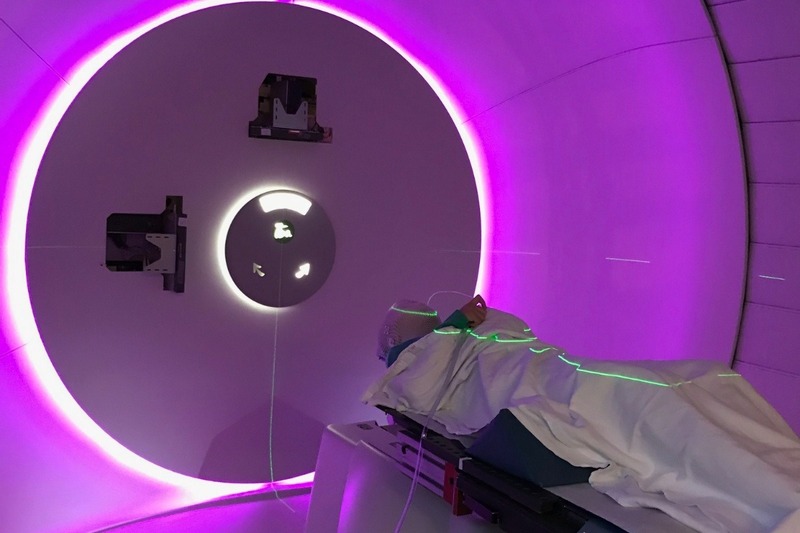 Proton is capable of delivering much more targeted beam than Photon which is used in most cancer hospitals. 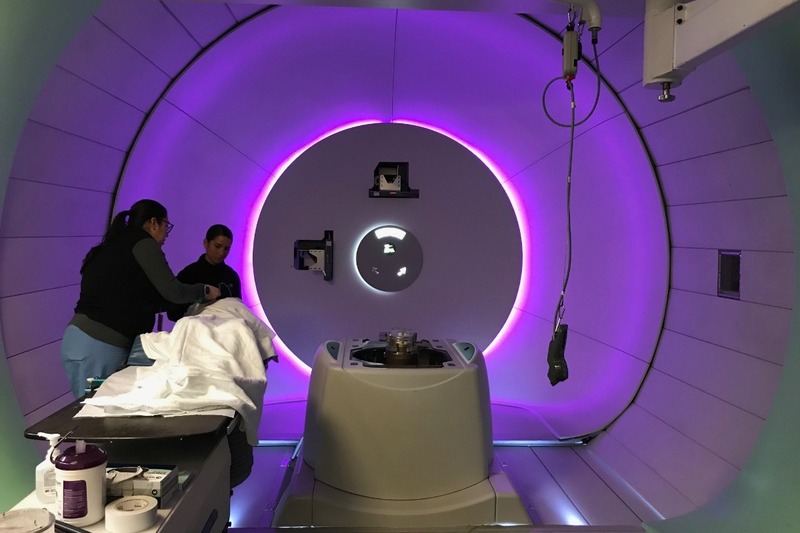 Mass Gen was the first to use Proton to treat patients and is one of only 25 Proton facilities in the nation. What’s more, Dr. Shannon MacDonald, Issy’s rad-oncologist at Mass Gen is a respected specialist, renowned for her decades of work with Germinoma cases. So here we are, in Boston, on 7th day of Proton already! She is receiving 20 treatments in total. Sharing, with Issy’s permission, her Proton radiation experience. It is our hope, when and if you meet another brain radiation patient young or old, you will share Issy’s experience and reassure them. She was anxious on the first day, but now, she feels so relaxed lying there, she comes out smiling. Pic 1- this is the ’gantry’ where Proton beam is delivered to target fields using custom brass aperture. Nurses position Issy to precision each time. Pic 2- here she is, ready for treatment. The mask is to restrict her movement during beam time. They made accommodation for a thin tube so she can suction if she needs to (still can’t swallow!). Pic 3- you can see the brass aperture under her head. She has 3 of them, for the 3 diff fields and depths. Actual beam time is prob less than 2 mins. Fun facts: she blasts Taylor Swift or the Greatest Showman soundtrack. The Gantry background color can change- she goes for purple but there is a remote to change colors. Even disco lighting! Fascinating... right? We are forever grateful for the amazing technology, facility, staff and God’s perfect timing on getting us to this point. We are incredibly blessed. Merriest Christmas and Brightest New Year! We are delighted to report that Issy is now home getting physical and occupational therapies, speech pathologist to help retrain her swallowing muscles and school tutoring to keep up with 7th grade! All the while trekking to Yale weekly for various follow-ups. She has two more rounds of chemo left, which means about 6-8 weeks left in that treatment portion. She will get a little break after that, then few weeks of radiation, TBD. While Issy is weaker since chemo started and pretty much in isolation due to ultra-low immune, her spirit never falters and is even OK that she still can't swallow because that would've meant "tasting all the medicine that I have to take!" along with the yummy (?) hospital food. It has been 78 days since our extraordinary journey began and no doubt there is a long ways to go. Yes, we have moments of despair but more than anything, we feel beyond blessed and encouraged knowing we are surrounded by loving, incredible community who reminds us daily that we are never alone. We are forever changed by your grace and compassion. THANK YOU for being with us, and WOW to friends and colleagues from every chapter of our lives! We can't wait to celebrate with you all at the finish line. We are so thankful for ALL of you for the overwhelming outpouring of love, prayers, support, warm thoughts, well wishes, and good vibes that this amazing community have been pouring on Issy. We are truly humbled and blessed beyond measure to receive such a tremendous gift. Thank you. We are happy to report that Issy is making great progress. The cancerous brain tumor was removed completely on 7/4 and the subsequent spinal tap was clear, indicating that the cancer is localized. She has been at an acute rehab hospital in New Britain, CT since last Friday (7/20) receiving physical therapy for swallowing, central apnea and physical mobility. She is also scheduled to begin the first of four rounds of chemotherapy back at Yale late next week. The road ahead is long and challenging but we are confident that with the continual support of this community, Issy will make a complete recovery sooner than expected, beating all odds.